It was the fabulous Molly Peacock, one of my mentors in Spalding's MFA program, who introduced me to Wild Flight and the multifaceted poetry of Christine Rhein. In addition to the recommendation-review below, I also had the opportunity to interview Christine. Click here for the interview and to read more about her. their homeland, the flight of bullets in Detroit, flying in an airplane, a two-year old flying “his bright red helicopter / through the sunshine of the room” (“Hero”) and birds, birds everywhere. Rhein weaves in other elements as well—the motifs of war, of nesting, and of children/childhood. She engages the reader with juxtapositions: kindness in the face of cruelty, the mix of science and art and the daily news, the precision of mathematical logic applied to violence and to the morass of human suffering. Filled with beautifully written poems that lean toward the narrative (the book teems with stories), Wild Flight flows smoothly from start to finish. 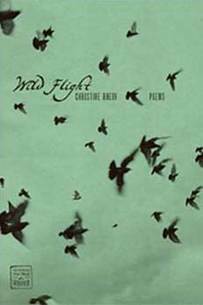 The subject of the first of the five sections in Wild Flight is war. The bulk of the poems in this section are about Rhein’s father in WW II Germany, when he was a child fleeing his German homeland with his family. The first poem, “Gift,” pulls the reader in with a story about Rhein's father when he was a schoolboy and a certain Russian POW that worked in a park that the boy passed on his way home from school. One day, the POW whispered “Brot, Brot” to him, and in response, the boy hid his butter sandwich behind a tree. Day after day the child hid his lunches behind the tree for the POW, German guards so close they surely must have seen him. Decades later, Rhein returns to that very place with her father, “the tree—grown huge now.” Her father recounts “that afternoon when he found a toy, / a little wooden gun, propped against / the trunk” of the tree, carved and left there by the POW. In the last stanza of the poem, Rhein tells us that she likes to imagine that the POW could see her father smile when he found the wooden gun—she likes to think that the POW “lived / to carve another make-believe / pistol” for his own son. empty sockets starting right through me. “Self-Portrait, Three-Way Mirror” has an interesting shape on the page, what some might call a cleave poem. It has two columns—each column is a poem in its own right, and each column-poem is also a self-portrait. Rhein is a former mechanical engineer, and so the first column is a portrait of that engineer who “remembers the rumble: / indoor engines, full-throttle roar … a certain and safe design.” The second column is a portrait of Rhein as “the poet recalling childhood.” As the reader reads across the lines of both columns, a third portrait emerges, that of Rhein as the mix of engineer and poet. Conversely, if one considers the physical layout of the poem on the page to be a “three-way mirror,” then each column is one of those mirrors. And as each column-poem clings to its respective right or left margin, it leaves a jagged empty space in the center. The third ‘mirror’—the one in the center—then, is the white-space gap between the two columns. Each portrait-poem stares at the other on the page, across the chasm of that blank center-mirror. The second section also includes a number of poems inspired by the news, such as “In the Morning Paper,” which is about Mohammed Sesay of Sierra Leone who had his hands amputated by those in the Revolutionary United Front (RUF). The speaker of the poem offers details of Sesay’s experience, e.g., “Already he’s relived the moments countless times: Sun-glare / on the machete. A butcher-quick whir. The blade thudding … .” Rhein then juxtaposes the horror of that experience with “He will not see this photograph, his own steady gaze / or mine, as I read, drink coffee, turn the page.” This parting gesture of the speaker—the nonchalance, the turning of the page—is, of course, a commentary on indifference to suffering. There is no self-righteousness here, though, as the speaker openly indicts herself along with the rest of us who are privileged, we who are complicit in doing nothing. The fourth section of the book also includes more persona poems, such as “Imagining Her Letter,” in which Rhein writes in the voice of Louann Mims, the 78-year-old woman who experienced the destruction of Hurricane Katrina in New Orleans and was featured on NPR’s This American Life, and the poem “Artiste Maurice Bennett Explains His ‘Burning Desire’,” in which Rhein speaks as Bennett, an artist who works in toast (yes, toast—he calls himself the Toastman), regarding his 2001 version of the Mona Lisa made in toast. While the fifth section continues to offer various considerations of flight, and continues with the motifs of war and childhood/children, the main thread of this section is nesting: home, love, marriage, family. A lot of rocket and mortar attacks. We go everywhere in body armor and helmet. the blog, the news, eyewitness and breaking. Sixty years ago, victorious giant headlines. Today, “Parade of Troops Celebrate . . .
Rhein uses juxtaposition and ambiguity to enrich her poems and this final poem is no exception. Near the end of this closing poem, the speaker answers her own question, which opened the poem, when she says “so why not write about the strawberry finches / building a nest outside my front window, … .” The responding text of the soldier-blogger concurs—his words are all about the birds “… near an amphitheater from Alexander the Great’s time / a black-crowned night heron, a few little egrets … my first laughing dove,” his bird, the laughing dove, leaving the reader with a final image: laughter and the symbol of peace, both in the face of war. A welder in Moldova hasn't been paid in 3 years. He has 1 wife, 1 child, and 2 kidneys. the sale of 1 kidney for 30 years' wages. is a cylinder, a surface, or a bowl. more than the Moldovan does. a statistic. Prove his theory using AIDS victims. Solve for grief in Africa. Edvard Munch painted different versions of The Scream. the intensity of the blood - red sky. the pattern obeyed by sunflower petals, pinecone whorls. for the same kind of beauty. Your dishwasher breaks on Monday. he'll give you free 2 boxes of detergent if you buy today. his family will eat macaroni & cheese all week? buys a baby-sized Gucci leather biker’s jacket for $1500? b) you buy a double caffe latte for $3? won’t survive the next millennium unless they colonize space. Write an equation to show who goes, who stays. Nancy Chen Long works at Indiana University and lives with her woodsman husband and blue-eyed dog in a small cedar cabin in the forested hills of south-central Indiana. At this time (June 2012), you'll find her recent and forthcoming work in RHINO, The Louisville Review, Roanoke Review, and Adanna Literary Journal.